This guest post was contributed by Ally Huang is a 4th year PhD student at MIT. While I had always enjoyed learning about biology in high school, it wasn’t until I started working in my first molecular biology lab in college that I really fell in love with it. Something about being able to actually hold all those seemingly abstract biological reactions that I learned about from textbooks just made everything click in my head and left me thinking: I wish I had this kind of experience earlier! After all, students build circuits in physics class to learn about electronics or mix chemicals together in chemistry to see what happens, but there isn’t really an equivalent of a “chemistry kit” for topics in biology, especially those at the molecular and cellular level. The reason for this is cost and complexity – anyone who works in the lab knows how expensive tiny amounts of reagents are, how complicated (and again, expensive) the different machines are, and how many regulations are in place to keep everyone safe. None of this is conducive to a classroom setting, especially for a school with a limited budget. While there are more and more molecular biology-based activities making their way into high school classrooms, like gel electrophoresis to separate DNA or transforming cells with green fluorescent protein, these activities are limited to those schools fortunate enough to have the funding and the resources to provide them to their students. My desire to create a set of low-cost, easy-to-use educational biology activities – that any school could afford – led me to develop BioBits ExplorerTM and BioBits BrightTM, biology kits based on freeze-dried, cell-free (FD-CF) components. Typically, if you want to make a protein – say green fluorescent protein – you first need the DNA sequence that encodes it. That DNA sequence then needs to be incorporated into a host cell (through a process called transformation), essentially giving the cell all the instructions it needs to produce that green fluorescent protein through transcription and translation. Unfortunately, having live cells in a classroom presents equipment needs, such as shakers and incubators, and biosafety issues, such as how to dispose of the live cells. The alternative is to express the protein in a cell-free manner. This is like taking an engine out of the car – you can still use the engine as a power source, but now you don’t have to worry about operating the rest of the car as well. Similarly, cell free expression systems contain all the parts needed to produce proteins without the need to handle a living, replicating organism. Furthermore, cell free systems can be freeze-dried into pellets (FD-CF pellets), leaving them shelf-stable until water is added and protein production proceeds. FD-CF pellets are easy for students to use in the classroom because the students simply need to add water to express a variety of proteins. 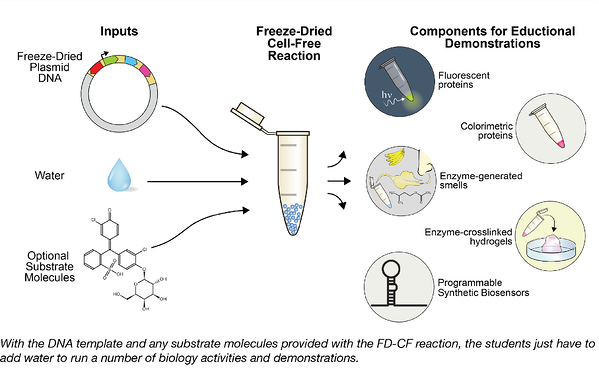 FD-CF reactions are also cost-effective, as each one is as cheap as 10 cents, making activities designed with FD-CF reactions affordable to many schools. Most importantly, experiments for FD-CF reactions can be fun and engaging for students. In our BioBits kit for example, we’ve designed FD-CF experiments that result in outputs that students can easily sense, whether that’s bright fluorescent proteins that they can see, enzymes that can convert certain chemicals into fragrances that they can smell, or enzymes that can create hydrogels that they can touch. With BioBits, we want students to make the connection between the facts they’ve learned in the textbooks with real world results that they can see, smell, and touch. Along the way, we hope they’ll also see how fun biology can be! What can BioBits do for you? We initially developed the BioBits kit to be used in high school classrooms, but it could be widely adapted and used in a variety of settings. If you are a biology teacher at the elementary, middle, or high school level, feel free to check out one of our kits and accompanying curriculum to see if any of the activities fit your lesson plans. If you are an instructor at the college level, perhaps consider using some elements of BioBits to transition your undergraduate students from the classroom to the lab. You could give your undergrads hands-on experience with the central dogma while also giving them practice with practical lab skills like developing a hypothesis, precisions pipetting, and good record keeping. Finally, if you are a fellow researcher interested in adapting your research ideas into hands-on educational activities using the BioBits platform, please get in touch with us! We’ll work with you to get the word out about your plasmids and their potential educational uses. We believe that biology education is something that should be available to everyone, and hope to build an open-source community of users who can share their experiences and knowledge with each other to help make learning biology more fun – bit by bit. Ally Huang is a 4th year PhD student at MIT in Biological Engineering and is interested in developing synthetic biology based tools for science outreach and advocacy. You can email her at ally@mit.edu. 1. Huang, Ally, et al. "BioBits™ Explorer: A modular synthetic biology education kit." Science Advances 4.8 (2018): eaat5105. PubMed PMID: 30083608. PubMed Central PMCID: PMC6070312. 2. Stark, Jessica C., et al. "BioBits™ Bright: A fluorescent synthetic biology education kit." Science Advances 4.8 (2018): eaat5107. PubMed PMID: 30083609. PubMed Central PMCID: PMC6070313. Find the plasmids from this publication at Addgene!